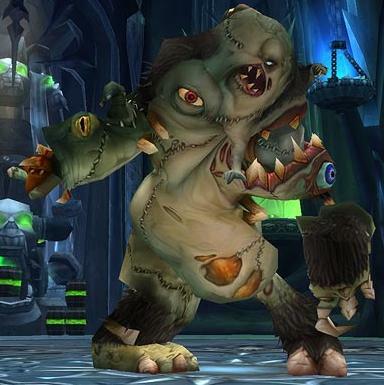 Rotface is one of three bosses residing in the Plagueworks wing of Icecrown Citadel. The defeat of this boss depends on decent raid awareness and good kiting of the adds. Once again, thanks go to Oshift for his help with the screenshots used in this guide. The above diagram shows the initial positioning of Rotface. The pull itself is, again, simple, with the tank simply charging into the room. 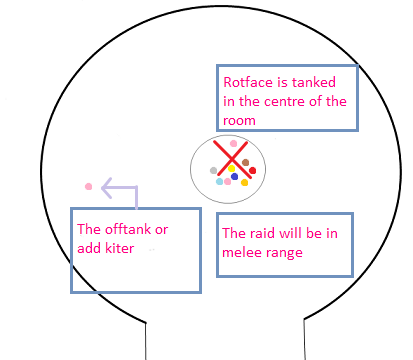 Rotface will be tanked close to where he is stood, in the very centre of the room. As you can see from the above screenshot, Blizzard have been kind enough, one again, to provide some useful ground markings as an indication of where to stand (or rather, a useful reminder). The circle in the centre of the room is where the boss should be tanked. The whole raid, minus your add kiter, will be stood in melee range. This positioning allows you to avoid the Ooze Flood, be out of the kiting path of the ooze adds and also to strafe easily to avoid the Slime Spray. As you enter the room, you may notice large tanks affixed to the walls around the room. These will release the Ooze Flood mechanism. This will flood a sector of the room with a vivid green ooze. This ooze will inflict around 6k damage per tick and slow movement speed. When correctly positioned in melee range around the boss (assuming he is in the centre of the room, as explained), this ability will not hit the raid. It does, however, effect the kiting path of the adds. This will be explained later. The Ooze Flood will affect one sector of the room at a time. Once it has flooded one of these sectors, it will not return to that part before flooding the other three sectors of the room. 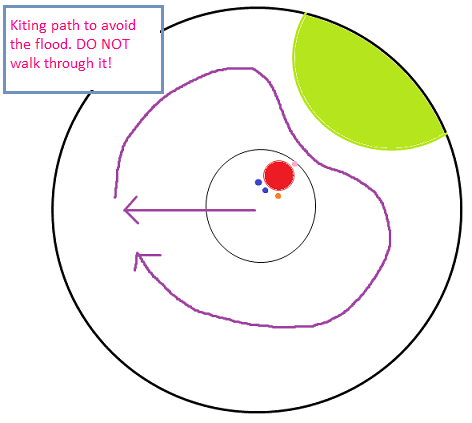 Taking the diagram above, if the first flood occurs in sector one (marked S1, on the diagram), the next flood can occur in sector two, sector three or sector four. Should it then hop to sector four, the remaining options for the third flood are sectors two and three. 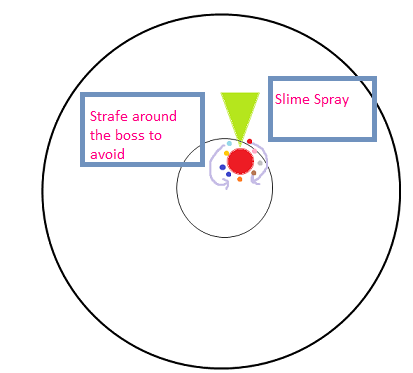 The next ability to concern yourself with as a ranged caster is the Slime Spray. This will occur approximately every 20 seconds and is a channelled nature based spell that will be cast in a cone shaped “spray” in front of the boss. It causes around 6k damage per tick so should you stand in it for the full duration of the channel, it’s significant damage. This is easy to avoid due to the position of the raid. Rotface will turn and face the direction he is about to spray to. If you’re in melee range as the positioning suggests, you can simply strafe around to ensure you remain behind the boss. Lastly is the Mutated Infection. This is cast every 15 seconds initially and infects a raid member with an infection inflicting around 4k damage per tick. This can be cleansed but much like Grobbulus in Naxxramas, there is a cost to doing so. As opposed to leaving behind a green cloud on the floor (like Grobbulus), upon cleansing this, a Small Ooze will spawn. This will have agro upon the person originally infected with the Mutated Infection and it can not be taunted off them. As such, these oozes have to be kited around the raid. Should you be targeted for the Mutated Infection, run immediately out of the raid and begin circling the raid group, the infection will be cleansed from you and a Small Ooze will begin chase. As mentioned above, every 15 seconds a raid member will be infected with a Mutated Infection (boss mods all announced this very clearly). The person with the infection needs to run out of raid. 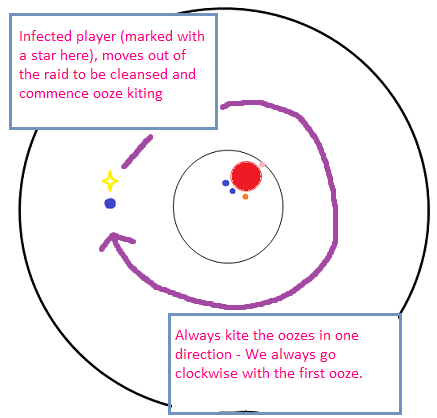 When the infection is cleansed, the player will spawn a Small Ooze which will have agro on them. This ooze needs to be kited around the room. Agreeing on one direction to kite the oozes in helps a lot when it comes to merging the ooze (I’ll come to this in a second). We always kite the oozes in a clockwise direction around the room. 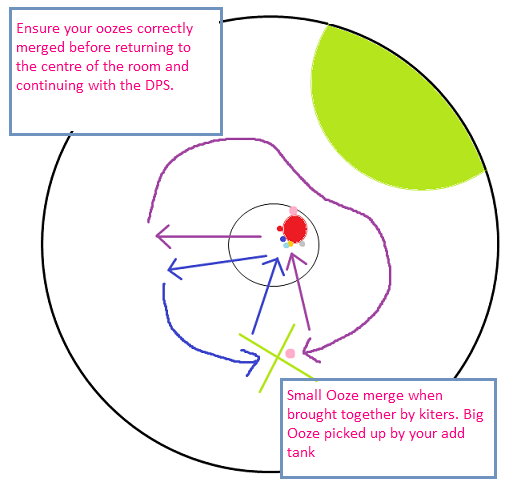 While the kiting is simple enough, you also have to remember the Ooze Flood from phase 1. Walking through this will not only cause you to take damage but will snare you and the Small Ooze will melee you. The next person to be targeted by the Mutated Infection should move out of the raid in the same way. This person should aim to kite counter clockwise. Once cleansed, the two kiters should run together. Their two Small Oozes will morph creating a Big Ooze. This Big Ooze can be taunted and is the reason for having a dedicated add kiter. Note:- Why kite the oozes round the edge I may hear you ask? Once merged, the Big Ooze gains abilities of his own, one being Sticky Ooze. This will leave a green puddle on the floor and anyone standing inside it will take around 3k nature damage per tick. Once you have one Big Ooze, your add tank will take over the kiting. Raid members will still get targeted for Mutated Infection and the newly spawned Small Ooze has to be merged into the existing Big Ooze. Your add tank should always kite the Big Ooze in one direction – ours kites clockwise. Try to always be aware of roughly where in the room your add tank is (scrolling out the camera distance really helps here for those who don’t already). 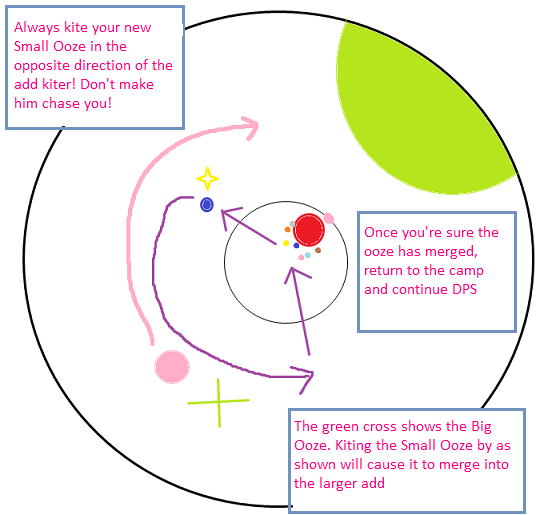 Should you be targeted with the infection you need to run out of the raid and ahead of your add tank’s kiting path. Run towards him (so anti clockwise in our case) with your newly spawned Small Ooze. As you reach the add tank, your Small Ooze will merge with the Big Ooze and you’re free to return to the camp. Be 100% sure that your ooze has merged before returning. Always make sure you run your add towards the add tank. Don’t expect him to miraculously chase you around the room and somehow merge the ooze for you. It makes sense that as you continue to merge these ooze adds, at some point, the ooze will get too large. Every time a small ooze is added to the large, it gains a charge of Unstable Ooze. This increases the damage dealt by the ooze by 20% per charge and stacks upto five times. Once the Big Ooze reaches five stacks it will freeze in place and begin to cast Unstable Ooze Explosion. The ooze will, quite literally, explode, destroying itself in the process. Multiple oozes will be fired around the room inflicting around 10k damage to anyone hit by them. This is easily avoided as they will fire at the place people were standing at the time of the cast. All raiders moving to the edge of the room will ensure they’re not hit by the explosion. As the explosion will destroy the Big Ooze, the cycle of add kiting starts again. The first person with the Mutated Infection needs to kite their own add around the room until a second player gets the debuff. Both plays will run their adds together, they will merge and your add tank can pick them up. This is continued until the end of the fight. Note that towards the end, the speed at which people get the Mutated Infection speeds up so good handling and kiting of the adds is essential. Due to the static nature of the boss in this encounter, it is perfectly designed for fire DPS totems (if you can use them without sacrificing raid buffs naturally). Don’t use cleansing totem, removing the infection before the player is out of the raid isn’t desirable. Aside from that, use your standard totem setup. People should be avoiding the damage anyway making a nature resistance totem somewhat a waste. This boss isn’t hard but the kiting can take some getting used to (think Grobbulus in Naxxramas). I grabbed the following screenshot in our last kill, hope it helps!